Corpus Christi, TX Gets More Snow (7") Than SE NM! Big fat fluffy snowflakes fell for awhile yesterday morning. Just a dusting at times throughout the day though in our backyard. 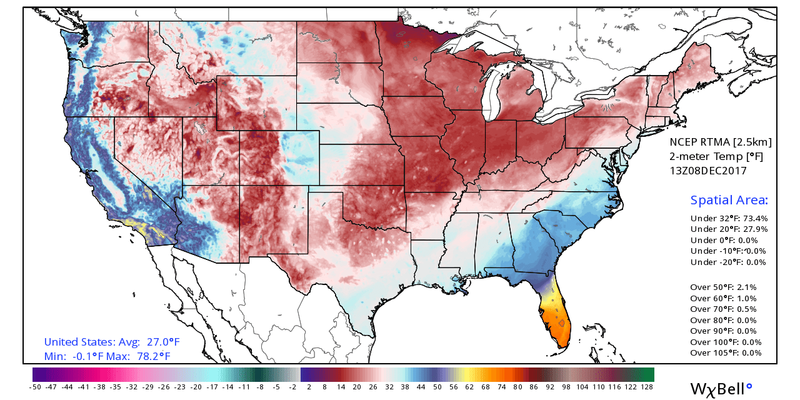 Coldest temps of the winter season thus far locally this morning. A few spots in the Sacramento Mountains dipped down into the single digits with teens to near 20ºF reported across the southeastern plains. 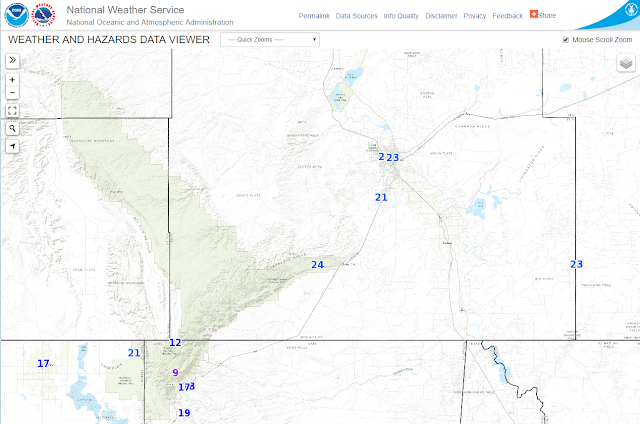 The Cloudcroft Fire Station PWS reported a low this morning of 6ºF. Reported 3-Day Storm Total Snowfall Amounts. 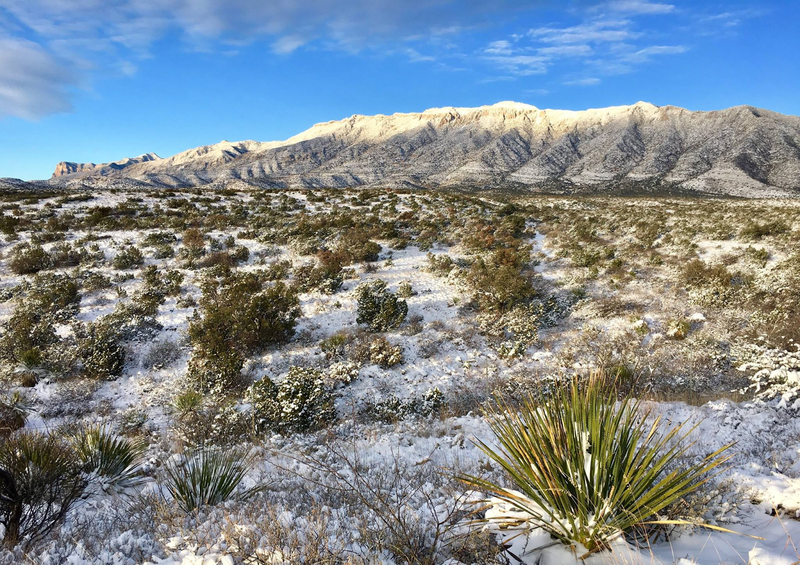 The Guadalupe Mountains This Morning. Photo Is Courtesy Of The Guadalupe Mtn's National Park Facebook Page. 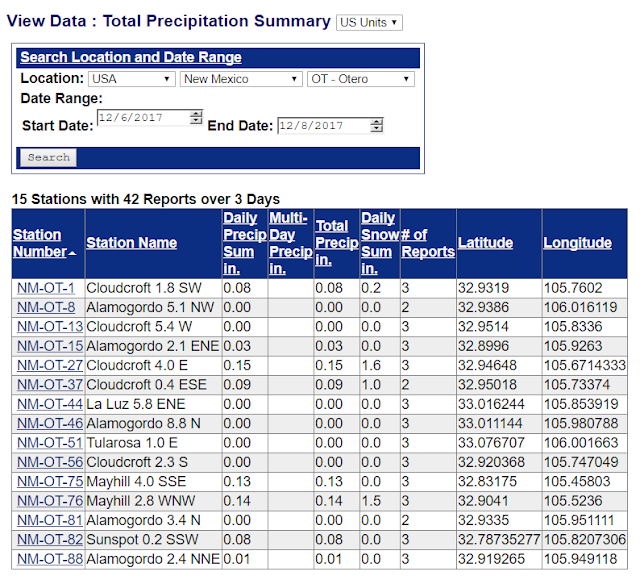 New Mexico CoCoRaHS 3-Day Rainfall/Snowfall Totals. 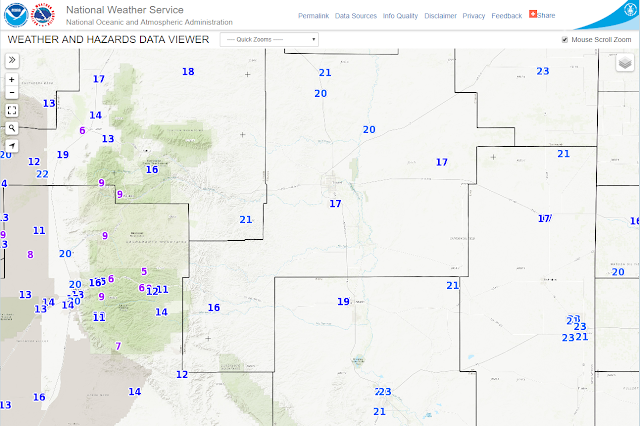 (As Of 9 AM MST This Morning). 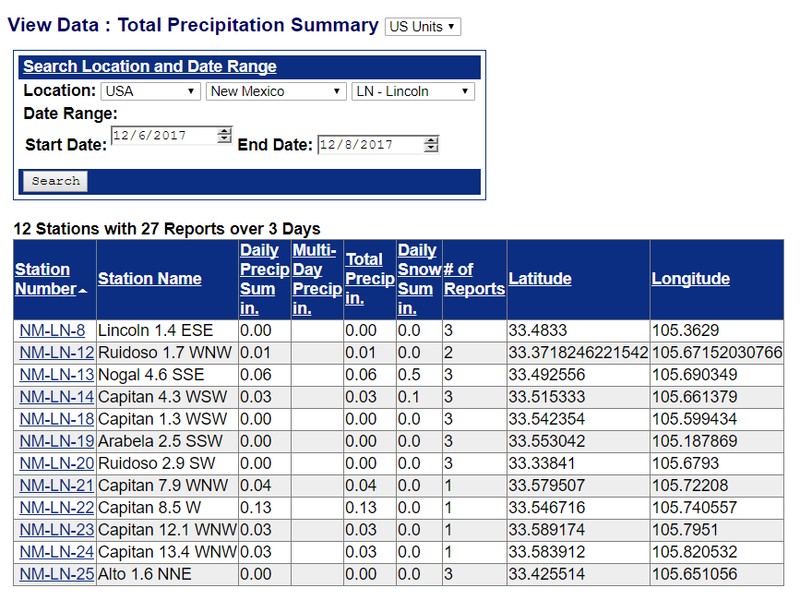 Locally the Queen CoCoRaHS observer reported the highest snowfall total with 5.5" over the past three days. 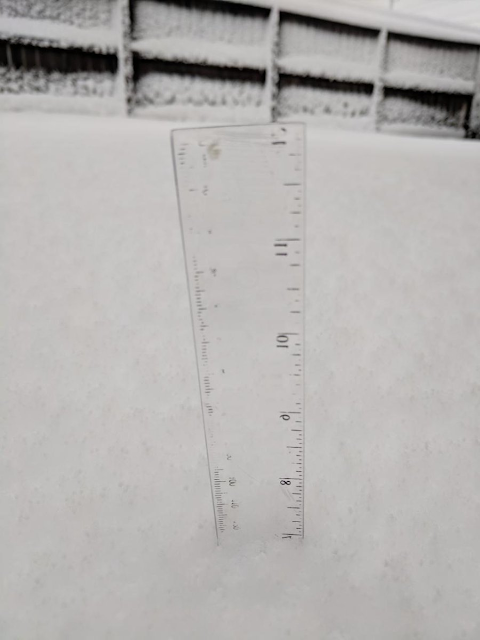 Lisa Doyal the NWS Dark Canyon Climate Co-Op Observer (located 15 miles west-southwest of Carlsbad) reported 4" on the ground early yesterday morning. 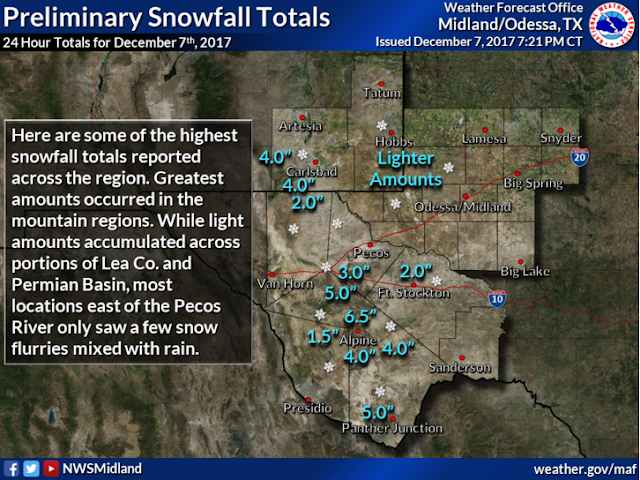 The public also reported 4" on the ground in Queen, 3" at the Rocky Arroyo crossing on State Highway 137 12 miles west-northwest of Carlsbad. 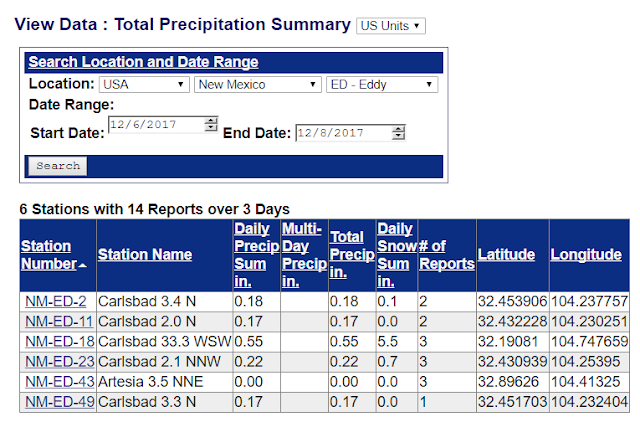 The snow depth increased as you went east, south and west of Carlsbad. There was a dusting in the Hobbs and Atoka areas. The public also reported 3" on the ground yesterday morning at the Rio Penasco RV Park in Mayhill. My co-workers reported 2" on the ground at the Hidalgo/Argo Gas Plant located 18 miles west of Orla, Texas. Finally Ski Apache west of Ruidoso picked up 6" of fresh powder out of this storm. 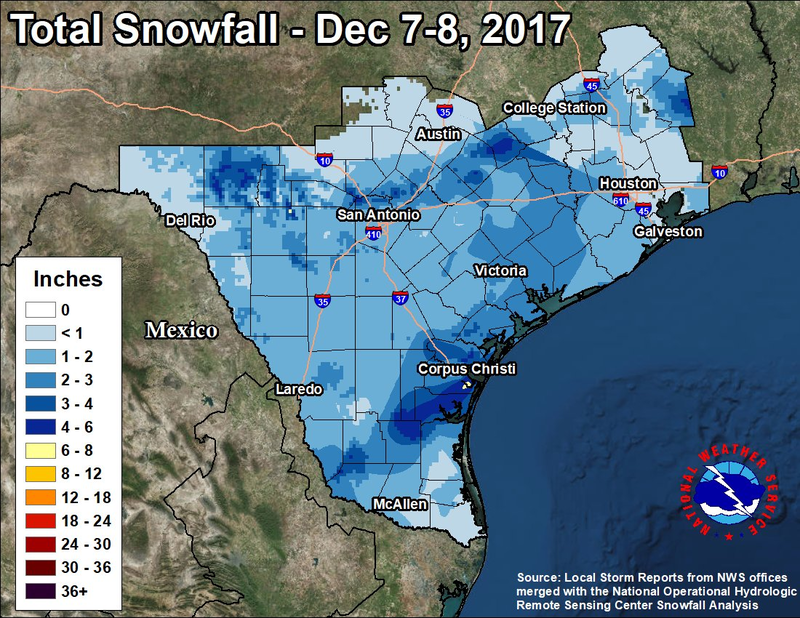 South Texas Gets More Snow Than SE NM. 7" Of Snow On The Ground In Corpus Christi, TX. Courtesy Of The Corpus Christi, TX NWS Office Twitter Page. Courtesy Of The Texas State Parks Twitter Page. 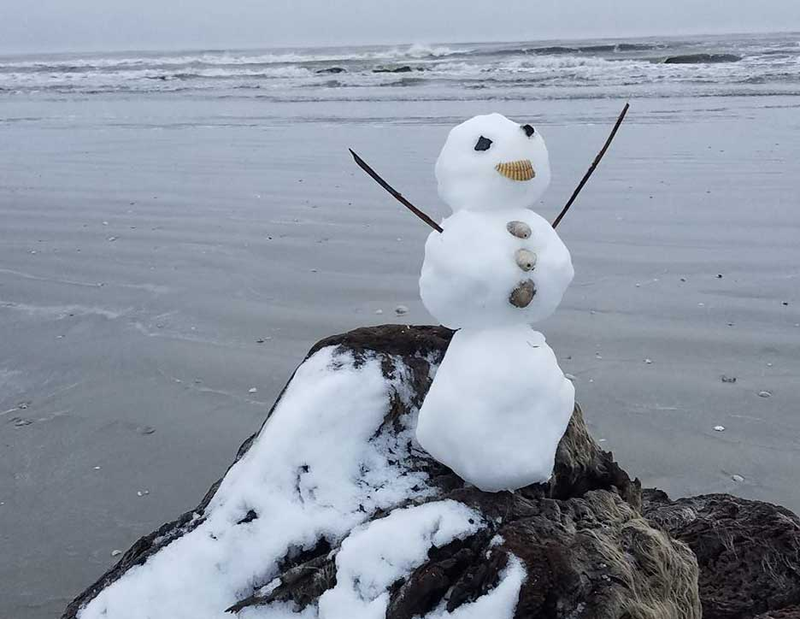 This Of All Things On Galveston Beach This Morning. Courtesy Of Megan Ives On Twitter. 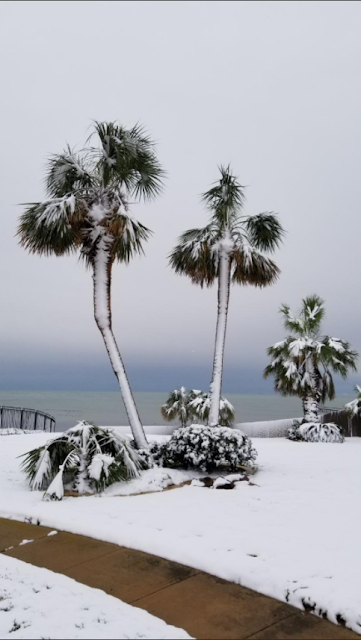 #Snow for the 1st time in 13 years in South TX in Corpus Christi this AM. And it looks like the biggest calendar-day snowfall in 69 years. 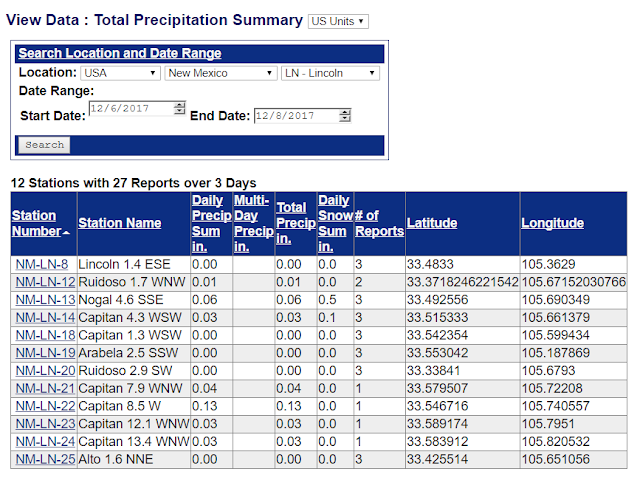 (2.3" 12/24/2004) Only the 8th time they've had measurable snow in 70 years. NWS Corpus Christi Storm Summary. So what were the surprises with this first winter storm of the season? 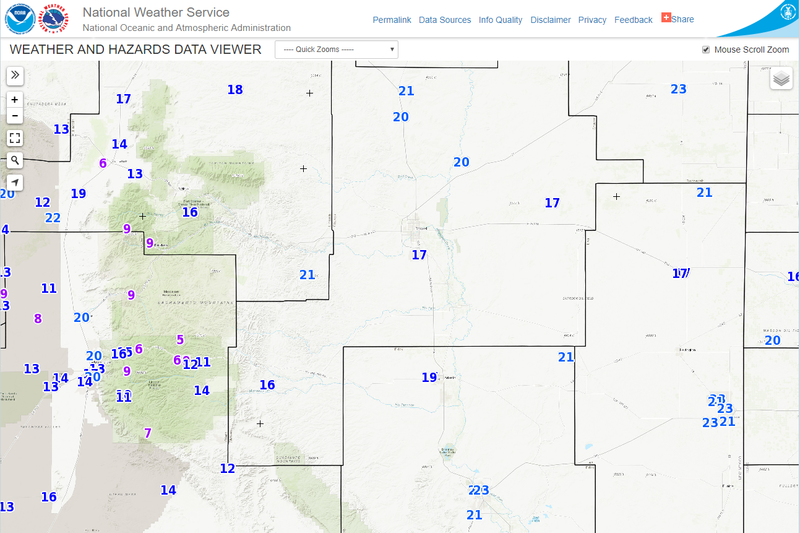 Most of SE NM and NM for that matter missed out. The storm track was far enough south that West and South Texas were favored to received the heaviest snows.